The startup uses a network of solar powered kiosks that use 50W solar-PV systems in charging up to 20 phones or a variation of other small electronic devices at once, while providing complementary retail and product sales. The franchisees called Juapreneurs are trained and start working with a phone charging business via the solar charging kiosks where they earn between 75-175 USD per month, which is 2.5 to 5 times the average monthly income in Tanzania. Juabar design considers security, modularity, locally available materials and manufacturing, and ease-of-use for its operators. With over 60% of the Tanzanian population using mobile phones as a means for communication, banking, agriculture services, civic engagement, education and healthcare services especially in rural areas, Juabar is trying to meet rural communities energy and connectivity needs. 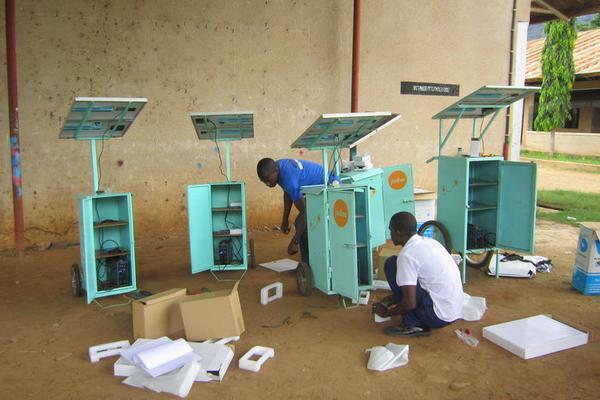 As a self-energized kiosk Juabar is a product designed to exist in public space as pop-up solar electrified shop for entrepreneurs.